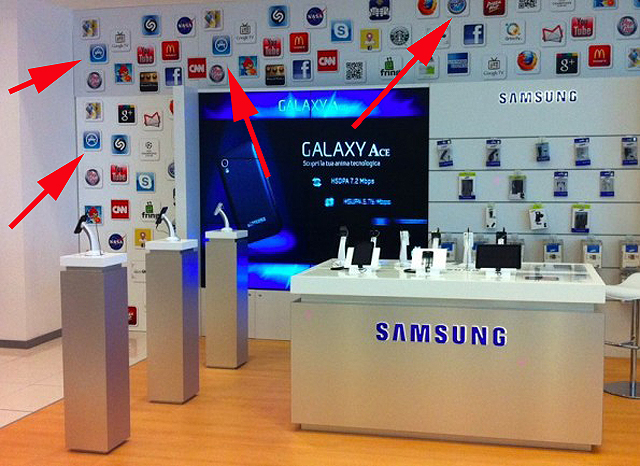 What Are Apple’s Icons Doing on Samsung’s Wall of Apps? If Samsung really does plan to take a bolder stance in its intellectual property battle with Apple, it best clean up its own operations first. Because it’s tough to take the company’s claims of commitment to innovation and distinctive design seriously when it really does seem to have a penchant for … er … referencing the work of others. Embarrassing, particularly given Apple’s allegations that Samsung “slavishly” copied the design of its iPhone and iPad devices. It’s hard to imagine there’s a reasonable explanation for this. Samsung phones don’t support iOS apps and I can’t imagine Apple is making the company a version of Safari. Now it’s possible this was a display left over from some other event or product, but still.